We help a lot of people move. We also track trends as to where and why people relocate across the US. People moving for marijuana is not a trend we’ve been tracking but it’s certainly an interesting question. With the new administration poised to slow down the legalization of marijuana, now seems like a good time to jump into the data and see if we can shed any light on whether or not pot is driving where people move. Out of 1500 inbound moves to states where recreational pot is legal (OR, WA, CA, NV, CO, ME, MA, AK), nearly 5% of people mentioned legal marijuana while discussing their move. Considering an estimated 43% of US adults have experimented with pot, 5% may not seem that shocking. We don’t ask people anything about marijuana as a part of our discovery call. That information doesn’t really help us plan a customer’s move. The fact that nearly 5% of people, unprompted, mentioned weed is astounding. It really begs the question, if we had asked about pot, how much higher would that percent be? (And no, we aren’t going to start asking). Even more interesting is the typical age of people who mentioned the drug. People mentioning marijuana were either between 25-30 or 65+. No one in the 30-65 range remarked on marijuana. This could suggest younger people are more comfortable and open about the topic, while professionals are more reticent to discuss anything that might impact their job prospects. Baby boomers, on the other hand, no longer have “the man” over their shoulder and can finally harken back to the carefree days they enjoyed in the 60s. Regardless, marijuana has always been a taboo topic and not one people like to discuss with strangers (it’s still illegal on the federal level FYI). One thing is for sure, the closed conversation around weed is beginning to open up a bit. But let’s get back to the primary question. Is getting stoned legally motivating people to move? We’ve only facilitated 3 moves where marijuana was the primary motivating factor behind the move and all 3 moves were medical related. One parent looking for a solution to her child’s seizures and 2 senior citizens looking for some natural relief. The reality is, and this is in line with virtually everyone else who has explored this question, people aren’t moving for marijuana except in a few select medical cases. Things like jobs, retirement, and family are still the primary forces driving relocations in the US. 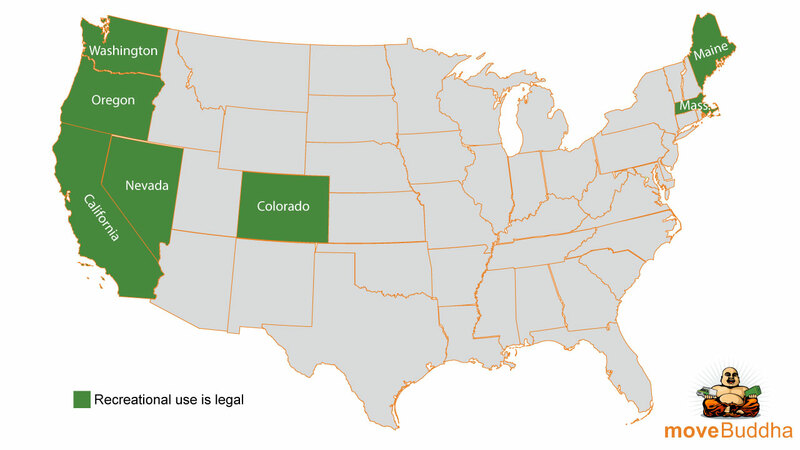 But for people moving into states where weed is fully legal, many are viewing it as a nice plus. An added bonus, if you will.